Abu Dhabi, United Arab Emirates, December 01, 2018: The 4th Annual In-Vitro Fertilization (IVF) Conference was opened today (November 30th) in Abu Dhabi by HE Sheikh Nahayan Mabarak Al Nahayan, UAE Minister of Tolerance. HE Dr. Amal Al Qubaisi, President of the Federal National Council in the UAE also attended the opening session of the conference. Organised by IVI Middle East Fertility Clinic, the In-Vitro Fertilization (IVF) Conference titled, ‘Latest Advancements in Enhancing Success Rates in ART, Anno – 2018’ brought together some of the foremost researchers to present their findings on key areas pertaining to reproductive medicine. 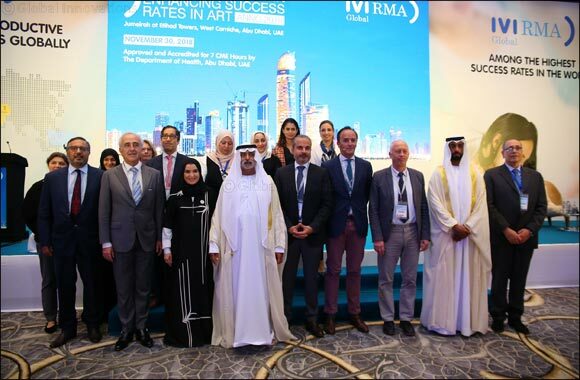 Fertility experts from around the world converged in Abu Dhabi to discuss the potential for new ground-breaking medical solutions for Assisted Reproductive Technologies (ART) in the conference that witnessed the presence of experts from fertility, gynaecology, obstetrics, genetics and embryology. Moreover, the conference shed light on ‘Personalisation of Ovarian Stimulation’, ‘Vitamin D and Infertility’ and ‘Oral Active Second-generation GnRH Antagonists’. In addition, the conference also featured an opening speech by His Excellency Sheikh Nahayan Mabarak Al Nahayan and highlighted significant topics related to fertility such as ‘Update on Treatment Modalities for Patients with Mayer’, ‘Personalized Luteal Phase Support’, ‘Uterine Abnormalities’, ‘IVF and Fetal Medicine’ and ‘Merck Symposium: Individualization is the Cornerstone of ART Success’. “Your gathering here in the year 2018, happens to coincide quite appropriately with this country’s celebration of the birth centennial of our nation’s founder, the late Sheikh Zayed bin Sultan Al Nahyan. In this Year of Zayed, we are reflecting on his achievements and his wisdom. Prominent among his achievements was the education of women and their advancement in the country’s workforce,” he added. “You know better than anyone the challenges of bringing all that wealth into being. At your 2nd international conference in 2016, I noted that your theme of all your gatherings must be that familiar word—Hope. The theme of hope reveals the monumental importance of your work. The theme of hope emphasizes the serious nature of your work for success. The theme of hope highlights the desperate desires of men and women wishing to be parents, hoping for a child. The theme of hope accounts for the most basic human aspiration—a better future, the kind of future at which Sheikh Zayed always aimed,” he said. “Last year, at your third international conference, I focused on the connection between your work and the concerns of my Ministry of Tolerance. I noted the critical importance of children in communicating the value of tolerance. If the UAE is to be a peaceful and productive global crossroads, all children living here must experience a good education that expands their horizons and helps them encounter and understand people, ideas, beliefs, and customs different from their own. Children in the UAE are maturing within a marvelously diverse population, composed of people from some 200 different nations, living and working together in peace. Children in the UAE live in a global society, and they must be educated as global citizens,” he said. “Conferences like this one make it possible for you to give your patients access to the latest artificial reproductive technologies, enhancing the likelihood they will be able to have children,” he said. “Helping others to become parents is also a wonderful way to promote tolerance. There is nothing like being a parent to help one identify with parents everywhere. As parents we transcend the usual boundaries that keep us from engaging and understanding people different from ourselves. We see not nationality or religion or culture or ethnicity. Instead we see other parents like us, other parents devoted to the children that they conceived in love. Go to any playground and watch children from diverse backgrounds play together. Then watch the parents of that diversity sharing the experiences their children are having. You will see smiles, nods of agreement, and signs of mutual understanding. Being a parent is one of a global society’s great unifying experiences,” he added. “At this fourth international reproductive medical conference, I want to highlight and commend the vision and energy of its host, IVI Middle East Fertility Clinic. As an unusually productive element of IVI RMA Global, this clinic in Abu Dhabi, and now in Dubai and Muscat as well, has in less than three years of operation achieved a pregnancy success rate of seventy percent, one of the highest rates for fertility clinics worldwide. Since coming to Abu Dhabi in 2015, IVI Middle East Fertility Clinic has been responsible for more than 500 pregnancies,” HE Sheikh Nahayan said. “Assisted Reproductive Technologies have come a long way since its evolution, and IVF is a wonderful tool for treating infertility, decreasing the risk for miscarriage, preserving fertility in cancer patients and facilitating proactive family planning. ART’s contribution to medicine has been significant, and conferences as these not only pave way for the introduction of revolutionary treatment solutions, but also facilitate access to best practices,” said Prof. Dr Human Fatemi, Subspecialist Reproductive Medicine & Reproductive Surgery and the Medical Director, IVI Middle East Fertility Clinic. Addressing challenges and future directions for IVF, the conference was spearheaded by high profile, scientific international speakers such as Prof. Dr Human Fatemi, Prof. Dr. Antonio Pellicer, Prof. Dr. Juan Garcia Velasco, Prof. Dr. Claus Yding Andersen, Prof. Sara Brucker, Dr. Barabara Lawrenz, Dr. Desislava Markova, Neelke De Munck, Dr. Laura Melado. Dr. Yanhe Liu and Dr. Daniela Galliano among many others. While the conference explored the potential of ‘AMH – A Reliable Ovarian Reserve Parameter’, it also focused on ‘The Hidden Effects of Oocyte Vitrification’ and ‘The Future of IVF’. In addition, the conference witnessed insightful discussions on ‘Time-lapse Embryo Selection: A Reflection at the Intersection’, ‘Vaginal and Uterine Microbiota’ and ‘Fertility Preservation’ among many others. It has been observed that Polycystic Ovarian Syndrome, Fibroids, Endometriosis, Obesity and Metabolic Syndrome and Cardiovascular diseases and Cancer are the top health issues that impact a women’s reproductive health in the UAE. However, using ART, doctors have been able to drive improvements across the care continuum. The 2018 conference hosted over 300 OB-GYN experts from the UAE and several renowned international speakers. It served as a great opportunity to network with experts from all areas of the field and focused on the major studies and breakthroughs in fertility treatments globally.